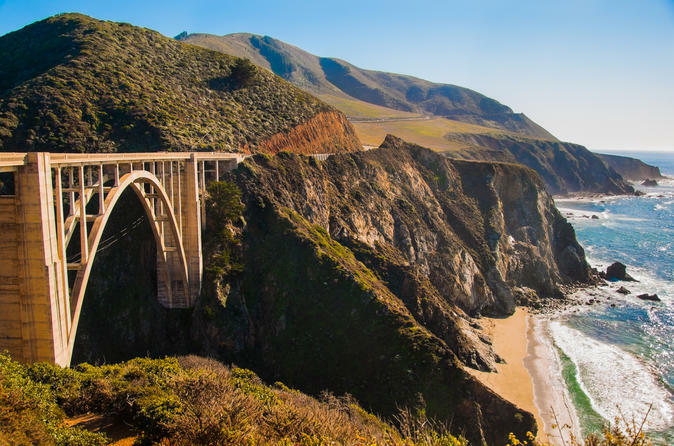 This tour will start traveling south on the famous Pacific Coast Highway, California Highway 1. We will set foot on Monterey’s famous Cannery Row for a chance to stroll among the shops and grab a fresh seafood lunch. The tour will follow the coast through the beautiful little town of Pacific Grove on the way to the 17 Mile Drive. This famous road winds its way between magnificent homes and the spectacular coastline, between the greens and tees of world famous golf courses and among the last remaining forest of a rare species of the Monterey Cypress. The drive finishes up at the Pebble Beach Village. Upon arrival in the enchanted town of Carmel-by-the-Sea, guests can explore the boutique shops on Ocean Avenue or be dazzled by the white sandy beach. If there is time & interest, we can visit the historic Carmel Mission. This tour also has optional short stops in Half Moon Bay or Santa Cruz. The Monterey & Carmel Explorer Tour will take you along California's Pacific Coast on your way to historic Monterey & picturesque Carmel-by-the-Sea along with a drive through Pacific Grove in between. Monterey Bay has great geologic and biological significance: it has an incredible abundance of sea life just offshore in the Monterey Bay National Marine Sanctuary, which borders 276 miles of California’s spectacular coastline. Monterey Bay was the site of the first Europeans to visit the land that became California. Several waves of industrial scale whaling and fishing exploited the bounty of the huge undersea trench offshore. John Steinbeck (Grapes of Wrath) grew up in Salinas and spent much of his creative effort writing about the Monterey area. Two of his books are Tortilla Flat and Cannery Row. You’ll start the day traveling south on the famous Pacific Coast Highway, California Highway 1 (fog permitting). After an optional stop in Santa Cruz, a rest break, and optional photo stops along the way, you will set foot on Monterey’s famous Cannery Row for a chance to stroll among the shops and grab a fresh seafood lunch. If you bring your own lunch, you might be able to squeeze in a short trip to the world famous Monterey Aquarium (admission not included). After lunch, you will follow the coast through the beautiful little town of Pacific Grove on the way to the 17-Mile Drive. This famous road winds its way between magnificent homes and the spectacular coastline, between the greens and tees of world famous golf courses like Spyglass Hill, and among the last remaining forest of a rare species of trees, the Monterey Cypress, which is sculpted by relentless pacific breezes into fanciful shapes. The Lone Cypress is a very poignant example of one of these hardy trees hanging on to life (with the help of human engineering) in a seemingly impossible location. The drive finishes up at the Pebble Beach Village, where you can visit the Pro Shop and see the famous 18th Green. When you’ve paid that much for green fees, you don’t quit at sundown on the 16th hole! Upon arrival in the enchanted town of Carmel-by-the-Sea, you can explore the boutique shops on Ocean Avenue or be dazzled by the white sandy beach. If there is time and interest, we can visit the historic Carmel Mission as a last stop. This tour also has optional short stops in Half Moon Bay or Santa Cruz. Come and join our Monterey & Carmel Explorer Tour now for an exquisite experience.